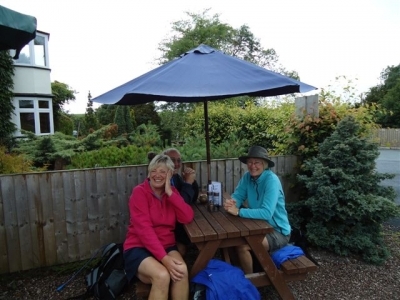 Mileage – Mary won’t believe this but the route is officially 34 miles running from Whitchurch to Frodsham or vice versa. Viv Lee & Barbara Shelton, Dave & Alma Walsh, Ken & Jacqui Beevers, Mary Robinson & Ruth Redmayne, Linda Jane Hamer & Jeanette Howard, John Pickton & John Bullen, Michele Tynan & Paul Banks – and for a guest appearance on Monday only Maggie Britton. Accommodation – the Forest Hills Hotel, Frodsham. Transport – Wheelers Community Transport run by John Harrison. 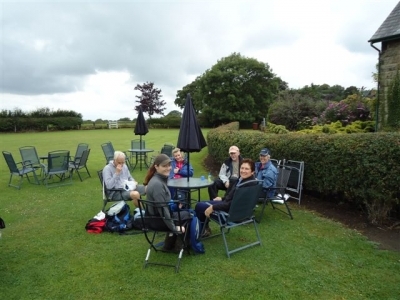 Refreshments Stop – “Wendies”, Stone House Farm, Manley Common. 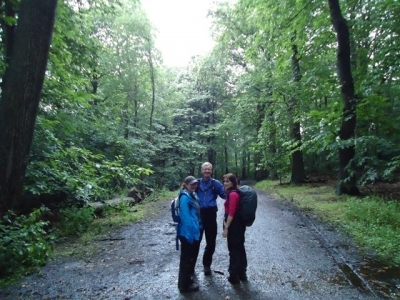 Guide - “Walking Cheshire’s Sandstone Trail” by Tony Bowerman. We have a saying us walkers don’t we, at least those eternal optimists among us, “it very rarely rains all day in this country”. Well we hit upon one when it did – Sunday July 17th 2011 – it rained and rained and rained and rained! Then blow us – we thought the Monday was going to follow suit but we did get some decent weather towards the end. Still we may have been wet through but it didn’t dampen our spirits and we had a superb time. “But the wind,” cried Mary. The traditional way of tackling this route is north/south but the last time we did it we had trouble with transport getting back from Whitchurch. So let’s get a plug in for our minibus man, John Harrison of Wheeler’s. What a gentleman! Nothing was too much trouble for him and we just can’t recommend him highly enough! Once we had talked to John we decided to break with tradition and start at Whitchurch. So we parked up in the beautiful and prosperous-looking Cheshire village of Tarporley, just over halfway on the route. Our cars were safe for the day and John dropped us at the start of the trail. 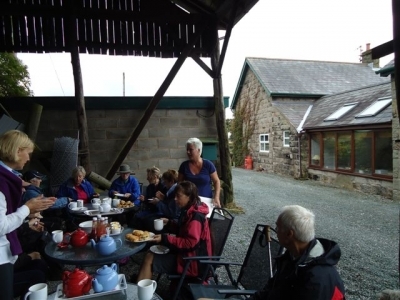 We started on the Whitchurch leg of the Llangollen Canal and it wasn’t long before a towpath-side café grabbed our attention! Well our excuse was we had travelled a long way. 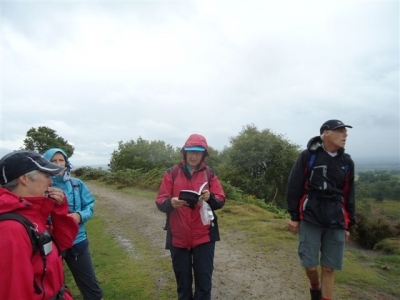 As we set off again the drizzle turned to rain and that way it stayed. We next had several miles across agricultural farmland nibbling on freshly picked garden peas, raspberries and whimberries. Delicious. The Trail bisects the magnificent racehorse training and breeding stud and stables of Man Utd’s Michael Owen before climbing onto our first sight of the sandstone ridge at Bickerton Hill. 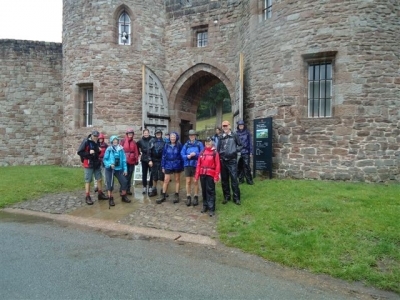 The latter part of the day was through magnificent woodland offering some slight shelter from the rain and past the impressive fortifications of Peckforton and Beeston Castles. However after twenty rain-sodden miles we weren’t sorry to see our cars. So now a mention for the absolute highlight of the trip – the Forest Hills Hotel. Wow! How lucky were we? 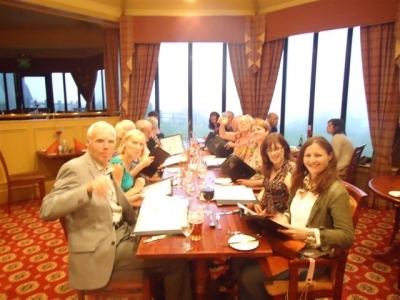 The management had arranged for us a group package discount and it was superb. What better way to recover from a 20 mile walk in pouring rain than to languish in a magnificent swimming pool and just keep nipping out into the steam room, sauna or hot tub! They also arranged a table for 14 for us and the meal was nothing less than superb. Sadly John had overdone it the first day and had to miss the second but our number was complimented by Maggie Britton who drove down on the Monday morning. So we packed into as few cars as possible and drove to Tarporley. After a brief look round the village we were off. “But the rain and the wind,” whinged Mary. 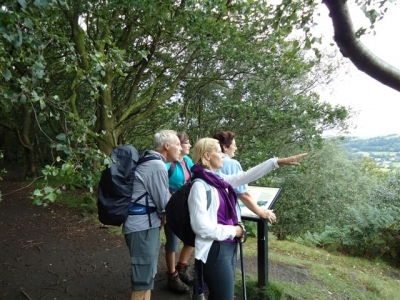 We had the best part of the walk to complete on day 2 up through the ancient woodland of Primrosehill and on to Delamere Forest. That low moaning noise known as Mary continued all day even when it stopped raining. Leaving the Forest we reached Manley Common and our planned lunchtime stop. 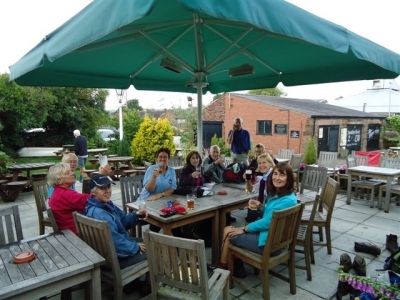 Wendy and Steve at Stone House Farm Café can really be counted as good friends of the club as they have now looked after us so well and so often. Wendy excelled herself on this day with a choice of sausage, bacon or egg barmcakes, never-ending pots of strong tea and her masterpiece – scones with strawberry jam! Not a lady with us didn’t want the recipe! 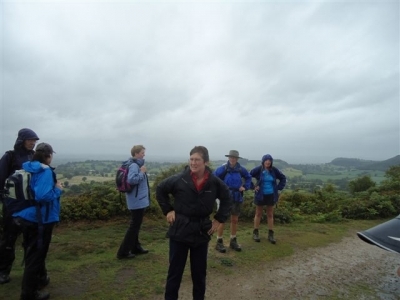 Wendy and Steve made the day for us – even Mary – and the last part of the walk along the prehistoric sandstone ridge was tackled with relish. It was a real test walking past our beautiful hotel and down into Frodsham to touch the finishing stone but the pint in the Bear’s Paw made it worthwhile. 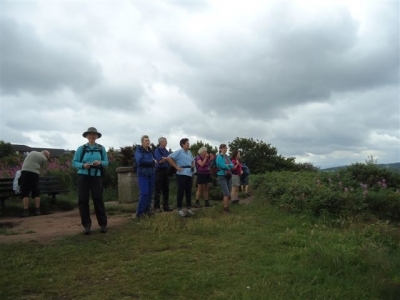 Yes the walk back up Frodsham Hill to our hotel was a true sting in the tail but those leisure facilities soon had us forgetting all about it. In fact over our truly memorable evening meal it was never even mentioned not even by you know who!